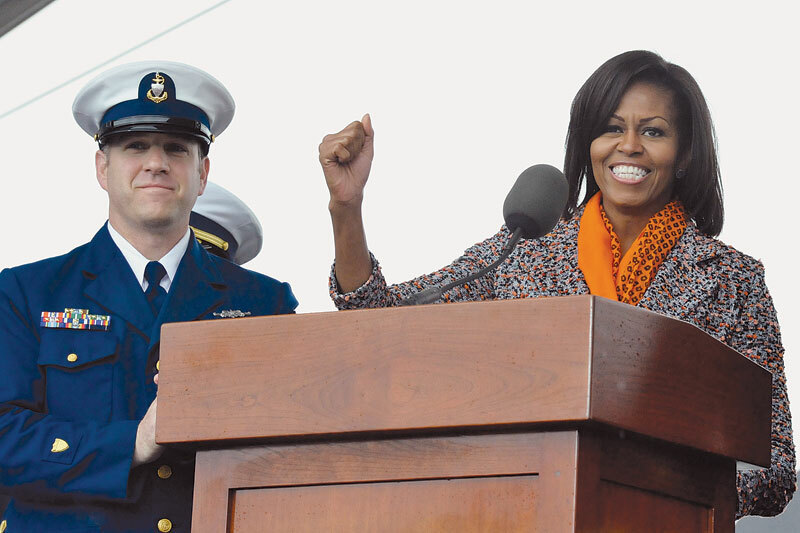 ALAMEDA (AP) — First Lady Michelle Obama was in Alameda March 31, to take part in the commissioning ceremony of the Coast Guard cutter Stratton. Standing under a tarp that sheltered her from the heavy rain that had started falling just before the ceremony, the first lady spoke for about five minutes to a mostly soaked crowd of a few hundred people, as she officially placed the cutter in active service. The ceremony marks the formal introduction of the vessel to the Coast Guard’s active fleet. Mrs. Obama, a sponsor of the cutter, helped christen the ship in Pascagoula, Miss. in 2010, by breaking a champagne bottle over the bow. Stratton has since undergone tests and a sea trial. The cutter is named after Dorothy Stratton, the director of the Coast Guard Women’s Reserve during World War II. The first lady’s appearance in Alameda came after she spoke at a presidential campaign reception at San Francisco’s California Academy of Sciences March 30, where about 350 people attended. With ticket prices starting at $500, the event was expected to raise at least $175,000 for the Obama presidential re-election campaign. After her stops in the San Francisco Bay area, Mrs. Obama traveled to Los Angeles for the Nickelodeon Kids’ Choice Awards.